In the last column, we explored the idea of willful blindness and how a combination of group influence and social conformity can lead to extremism. The relationship between willful blindness and self-awareness deserves some attention. All too often we operate on autopilot and for the most part, as Socrates would phrase it: "Live an unexamined life." In many careers, and especially in the field of education, there is a push for people to engage in reflective practice instead of mechanically relying on old habits and standard ways of acting. Reflective practice means being thoughtful about what you are doing and what results you are getting. It encourages you to methodologically experiment with your choices and behaviours to recognize what is effective and what is not. Reflective practice prompts you to consider what you do not currently know, your blind spots, and then to search for additional information which you use to make better decisions. A good place to start is with yourself. What taken for granted assumptions do you have about yourself and how people see you? Psychologists Joseph Luft and Harrington Ingham created a simple technique to help people better understand their relationship with self and others. The Johari Window (titled by combining their first names) is a way to categorize conscious and unconscious aspects of your being. The window works like a grid that can slide vertically and horizontally depending on the level of awareness within each of four quadrants - public, private, blind, and undiscovered self. The model represents the sum total of who you are – your feelings, experiences, views, attitudes, beliefs, intentions, fears, skills, talents, hopes, motivations, etc. The windowpanes change in size depending on the amount of knowledge they contain. Public Self – This is the part that you share regularly with others and discuss openly. It’s the “you” that is on display day in and day out. Your public personae allows for a common understanding of who you are, what you stand for, and why you act in certain ways. Private Self or Hidden Self – This is what you know about yourself but do not want others to find out. You may feel these parts are somehow embarrassing or shameful. They may make you feel vulnerable, weak or open to criticism. This area also includes positive qualities that you don’t necessarily want everyone else to know about due to your modesty or fear that people may increase their demands if they only knew what you were truly capable of achieving. It is common for people to meticulously hide certain things about themselves from public view and to hesitate to disclose them. If you can find the courage to bring forward your perceived weaknesses into the open, you often find that people are happy to be your ally in order for you to gain new skills and become stronger. Blind Self – This is what others see that you are not aware of. There are certain attitudes and behaviours that you reject about yourself and refuse to acknowledge. Some of our patterns and reactions are so ingrained that we fail to consciously recognize them and may even vehemently deny having those qualities. People don’t always feel comfortable pointing out our blind spots because they don’t want to offend or cause pain. As your level of confidence and self-esteem develops, you become comfortable in soliciting honest feedback in order to gain higher awareness of how others actual view you and what steps you might want to take for self-improvement. Undiscovered Self or Unknown Self – This is the self that you cannot see nor do others spot. It lies buried deep with in. Both good and bad qualities can lie dormant until they rise to the surface out of need or desire. This area represents your untapped consciousness and unfulfilled potential. The Undiscovered Self is an area of mystery and intrigue. Tuning into yourself through reflective practice and solitude can help to uncover aspects of yourself that may surprise you. 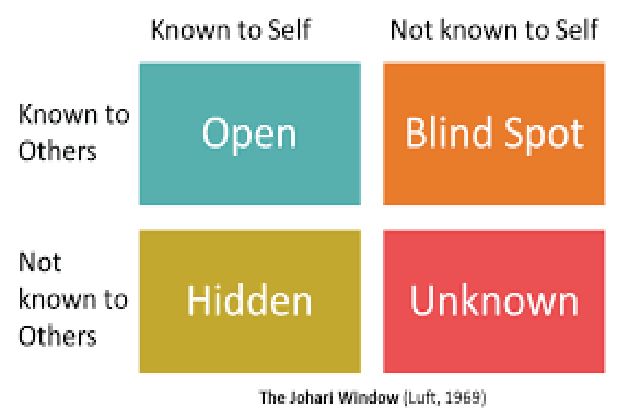 Johari’s Window is an easy to use tool to get you started on becoming increasingly aware of yourself in order to enjoy a more authentic life. You can take a simple online assessment at http://kevan.org/johari that will show you which quadrant is your dominant one. Insight gained through self-awareness will allow you to live more deliberately instead of operating by default. “Know thyself” are wise words to follow.